Ye Olde Blog here was totally wonky yesterday, so in case you missed *last* week’s pictures, which we JUST got around to posting, here they are. I’ll be honest – it was not our best post because WordPress kept eating our drafts, and it is a total pain in the tushie to try to get these up without Mommy’s laptop. Our tech support friend promised to take a look at it this weekend, so either we will get it back or be buying new one soon. We *need* it – we have a couple of reviews and our Summer Day Trip Guide to get out! 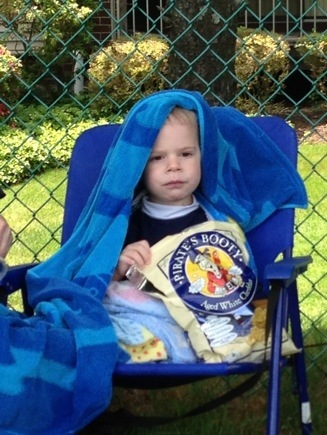 We spent the whole day on Sunday at the pool – Cole spent approximately 5 hours in the water, and 20 minutes warming up and eating Pirate’s Booty. Monday was my triumphant return to Aardvarks after two weeks of illness and then Memorial Day off. 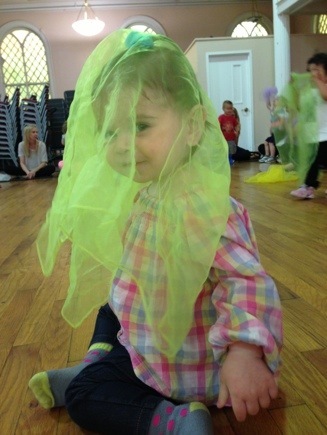 Our last class before the summer break is tomorrow! 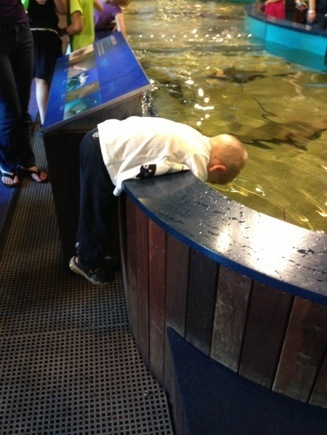 We visited the Norwalk Aquarium on Monday. Cole did not fall into the ray & shark tank, but not for lack of trying. We will have a full review of our visit this week – as soon a we have our computer back! Wednesday was pretty uneventful. 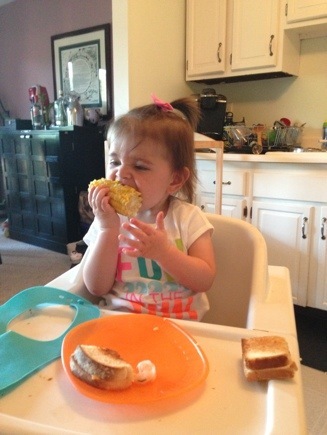 We had corn on the cob for dinner. Look at me! I’m a food blogger! Cole wants someone to stay in his room with him, Mommy and Daddy want me out of their bed. Win/win! 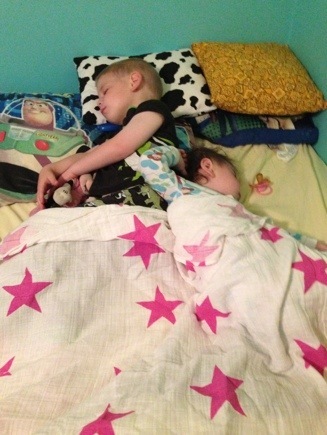 Until I wake up at 2:30 and decide I like their room better! Friday was totally sad and gloomy, and not just because we were hit by a tropical storm. It was Cole’s last day of preschool! Mommy took no pictures at all yesterday, so this unflattering one of Daddy’s is the best we’ve got. 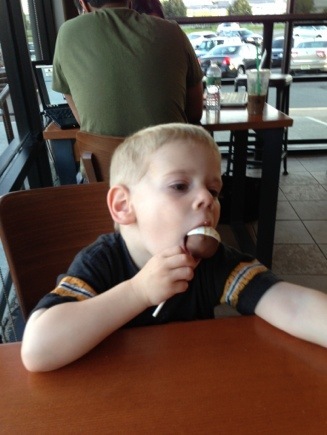 We visited with Grammy Boo and Coach for the day, and then Cole chose a Starbuck cake pop over ice cream when Daddy offered a treat on the way home! Again, sorry for the lame recap – we’ll improve this week, promise! The other super cool bit of news you mave missed yesterday was that our blog is #1 in its category on Top Mommy Blogs – we’d love it if you could take a second and vote to help keep us there! All you need to do is CLICK HERE, and that’s it. You’re done. Easy peasy! Thanks so much! 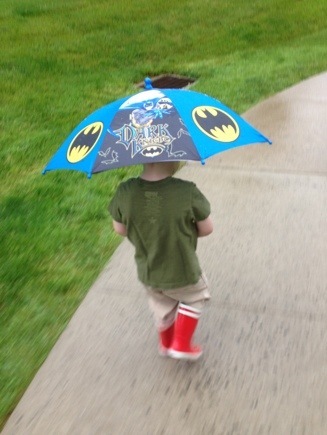 So cute – love the Batman umbrella!! Matthew’s last day of preschool is this coming Friday. I can’t wait – I need a break!! And I’m so SAD that school is over – now I have to figure out what to do with him during those hours! We really loved his teachers this year, too… He picked out that Batman umbrella on Thursday, and it’s a good thing it rained on Friday because I believe he would have had a heart attack if he didn’t get to use it soon! Can’t wait for the summer guide! Maybe the beach on Saturday? Your shark tank comment was HYSTERICAL!! It does look like he’s going to topple right in!